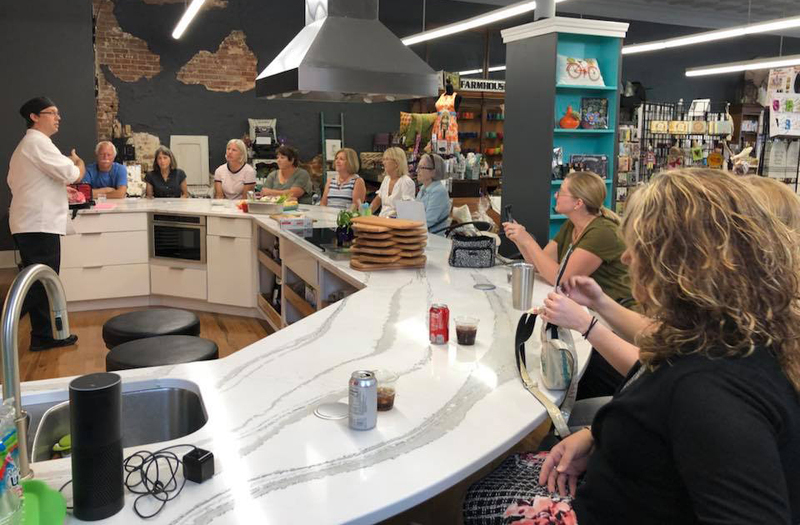 Following a two-year restoration, a new kitchen store opens in New Harmony’s historic Odd Fellows building — a formerly distressed building in the heart of downtown. New Harmony, on the banks of the Wabash River in southwest Indiana, was founded in 1814 as a spiritual sanctuary that later became a haven for international scientists, scholars, and educators who sought equality in communal living. It is a vibrant rural town whose spiritual and utopian heritage attracts visitors from throughout the U.S.
Michael and Mary Beth Guard became regular visitors after Mary Beth’s mom moved there in 2013. “We went through all the stages of New Harmony,” says Mary Beth. “First we thought, ‘What a nice town. I feel so relaxed when I’m here.’ Then, ‘I wonder what the houses go for.’ The next thing you know, we bought a house built in 1900.” They packed their belongings and moved from Oklahoma City to take up permanent residence in New Harmony. The Guards started looking at the town’s commercial buildings, dreaming of opening their own business. Indiana Landmarks had just finished restoring the exterior of the Odd Fellows hall, a vacant distressed building on a corner that was dragging down the main street in the National Historic Landmark town. The Guards bought the building from us and after two years of interior restoration, they opened Capers Emporium in June. Built in 1915, the landmark’s second floor served as the high-ceilinged lodge of the Independent Order of Odd Fellows. A hardware store and later a grocery operated on the street level. By 2013, the building was in bad shape, abandoned long ago when the grocery closed. 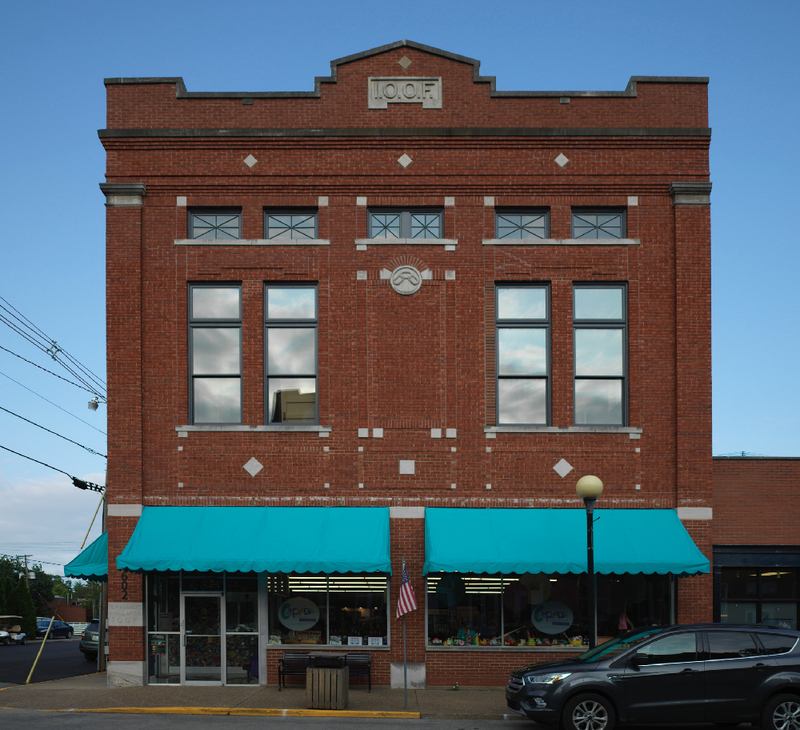 Indiana Landmarks partnered with our board member Jeremy Efroymson, Vice Chair of the Efroymson Family Fund of the Central Indiana Community Foundation, to rescue the building. A frequent visitor to New Harmony, and from a family with a commitment to historic preservation, Efroymson preserved the landmark and solve a town problem. We addressed deterioration caused by years of neglect and deferred maintenance – the building had been foreclosed – installing a new roof, repairing the masonry, replacing floor joists, and replicating and installing new energy efficient wood windows before selling to the Guards. Their newly opened Capers Emporium features an eclectic mix of practical and unusual items, from cookware and gourmet foods to home décor and fashion accessories. Capers also offers cooking classes, where students can observe and participate. To learn more about Capers Emporium, including store hours and class schedule, visit the shop’s Facebook page or call 812-682-6112. For more about the fascinating town of New Harmony, check out visitnewharmony.com/.